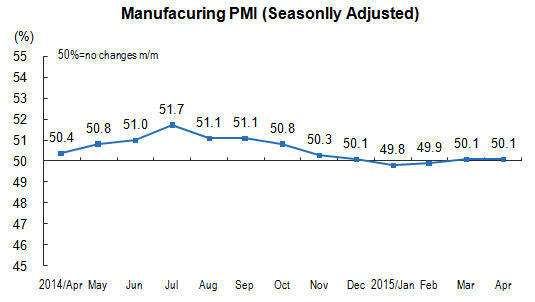 In April 2015, China's manufacturing purchasing managers index (PMI) was 50.1 percent, kept at the same level over last month, and above the threshold for two months. In view of the sizes of enterprises, the PMI of large-sized enterprises was 50.6 percent, decreased 0.9 percentage points month-on-month, continued to stay above the threshold; that of medium-sized and small-sized enterprises were 49.8 and 48.4 percent respectively, still below the threshold, but with a 1.5 percentage points increased, month-on-month. Among the five sub-indices composing PMI, the production index, new orders index and supplier delivery time index were continued higher than the threshold, while the employed person index and main raw materials inventory index were lower than the threshold. Production index was 52.6 percent, increased 0.5 percentage points month-on-month, and was higher than the threshold, indicating that the manufacturing production continued to maintain expanding, with a higher growth rate. New orders index was 50.2 percent, kept at the same level month-on-month, still stayed above the threshold, showing that the market demand of manufacturing sector continued to grow. Employed person index was 48.0 percent, decreased 0.4 percentage points month-on-month, and was below the threshold, indicating that the labor employment of manufacturing enterprises continued to decline. Main raw materials inventory index was 48.2 percent, increased 0.2 percentage points over last month, still stayed below the threshold, indicating that the raw material inventory for manufacturing production continued to reduce. Supplier delivery time index was 50.4 percent, increased 0.3 percentage points month-on-month, and rose over the threshold, indicating that the delivery time of manufacturing raw material suppliers had been accelerated slightly. Purchasing Managers Index (PMI) is an index summarized and compiled through the results of the monthly survey of enterprises purchasing managers. It covers every links of the enterprises, including purchasing, production, logistics, and so on. It is one of the leading indices which was commonly adopted by international society to monitor the macroeconomic trends, and played an important role in forecasting and monitoring. The threshold of PMI is usually using 50 percent as the cut-off point for economic performance. If PMI above 50 percent, it reflects the manufacturing economy is expanding； if less than 50 percent, it reflects the manufacturing economy is in recession.